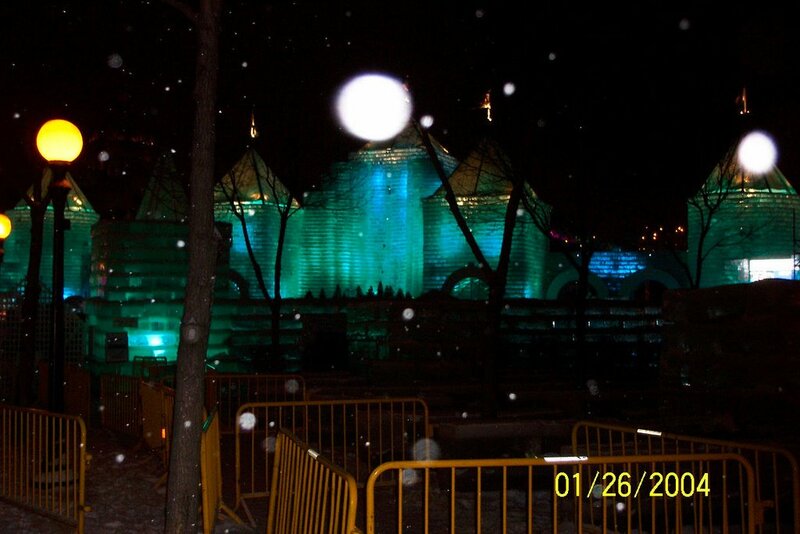 I had taken this photo back in the fall of 2006. 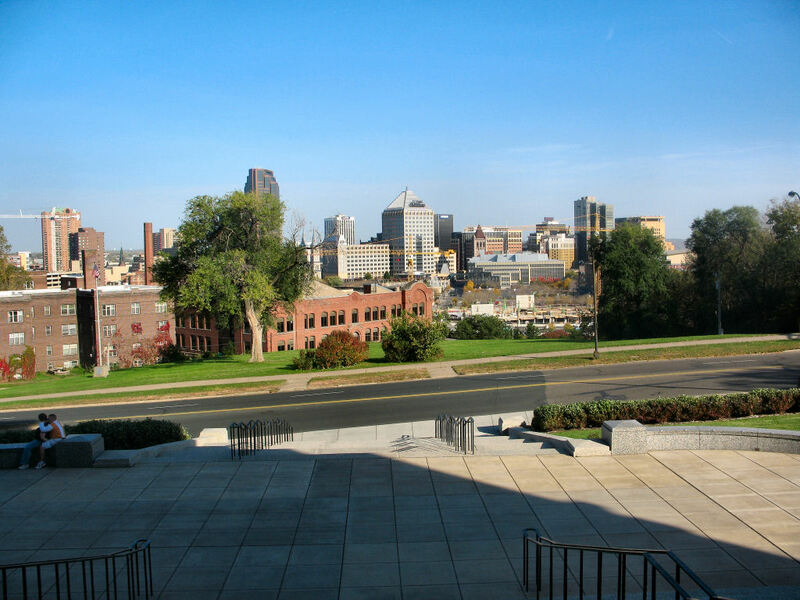 My intension was the St Paul downtown skyline from the steps of the Cathedral. 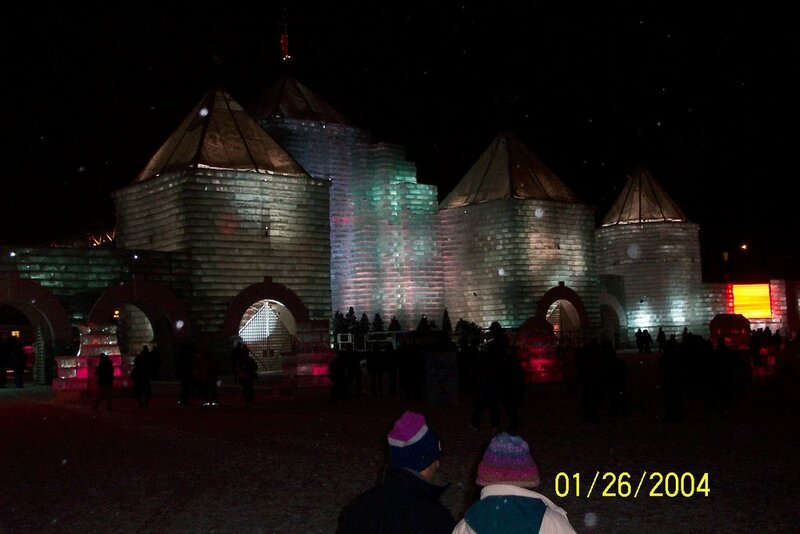 I've posted several shots from there in the past. I really didn't like the shot with the trees covering up a good portion of the skyline. I set this photo aside and hadn't planned on posting it here. Well, I looked at the photo and was about to send it to the bit bucket, when something caught my eye in the photo. Maybe you've already spotted my discovery, as I didn't until recently. What's even more scary is, I didn't notice anything out of the ordinary when I took the photo. As I think back to photo shooting that day. I recall the couple you see in the lower left corner sitting on the wall and the guy was giving a back rub. I didn't think anything of it, I let them be and went on with my photo shooting. Take a look at the couple in the corner. Now look closely where the girls left hand is. Which is why I'm now torn about posting this photo. Hopefully it will make some of you laugh about things we accidentally take a photo of. Last week I talked about going on a hike with my son at an old apple tree farm. 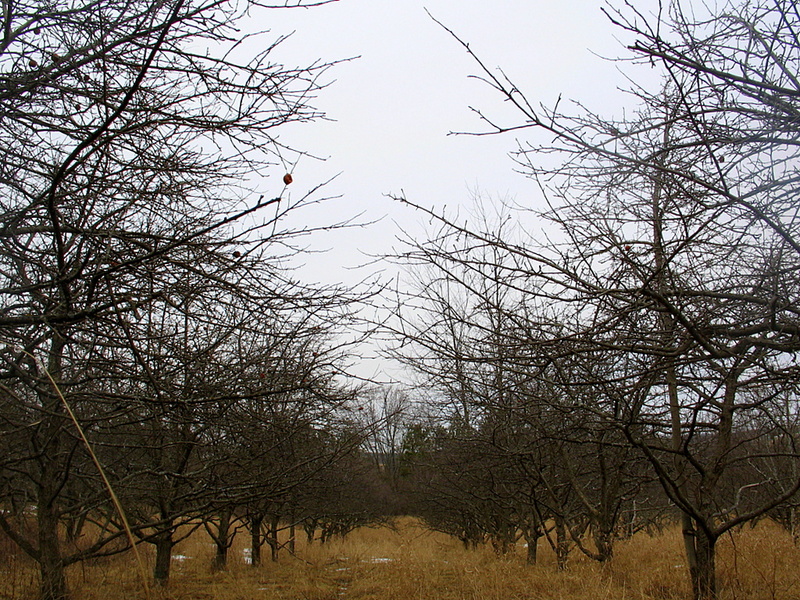 Talking with the current owners, they no longer prune the trees, but apples still grow on them every two years. They just don't look as pretty. This photo was taken as we were walking through one of the rows of trees. It just looked like a field of branches to me. 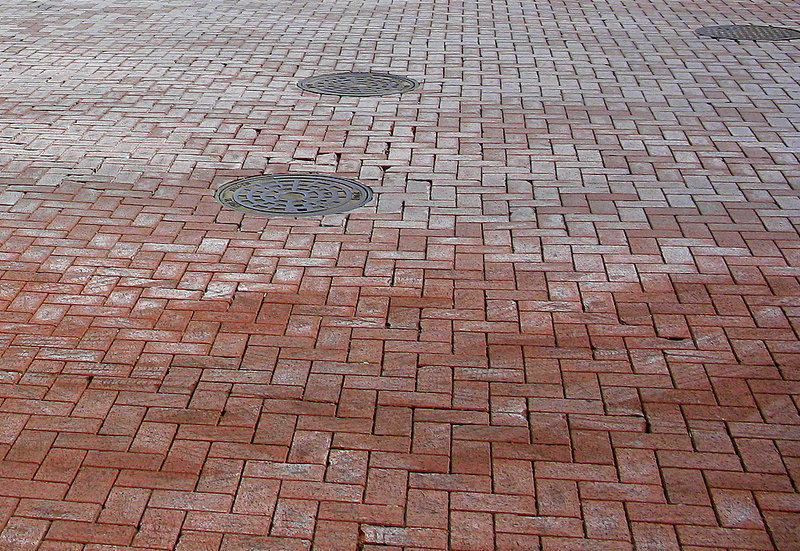 The street around Rice Park in downtown St Paul is covered with Brick. I thought this was the original brick work, but it has been redone recently. Thanks for the update. Most of the original streets in St Paul were paved with brick, but have tar covering them up for today's vehicles. There aught to be a law, one that states you cannot get or have the flu on your wedding anniversary. Wifey was flu ridden on our anniversary and I've been fighting it for the past couple days. Please make it go away. Standing in Rice Park located in downtown St Paul, I turned around and there was the 1st National Bank building nestled between two buildings. I really love the three different contrasts between the three buildings. Today is the day, 13 years ago that I walked down the isle and said those two simple words "I do" to my best friend in the world. You are the most important person to me, to our kids, to our family. Thirteen years! 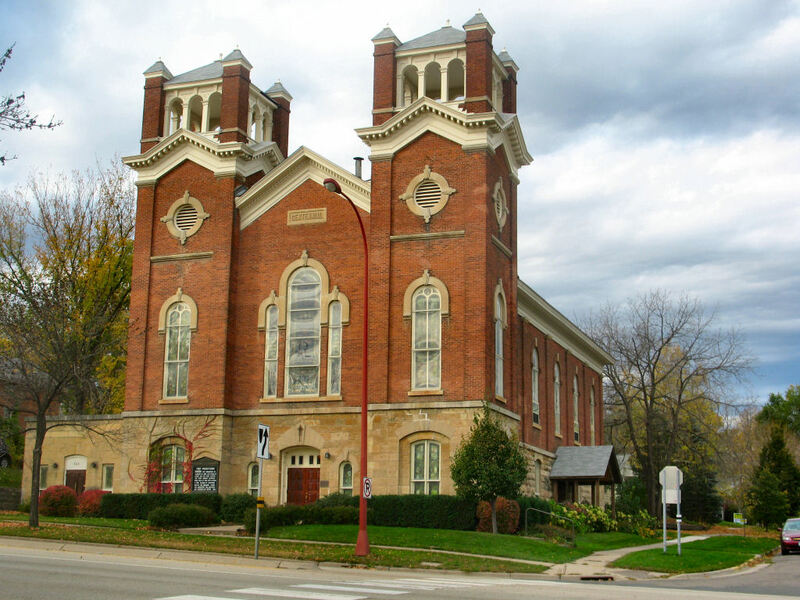 I thought it would be fitting to post a photo of the church we were married in. The First Presbyterian church in Hastings, just as you cross the Mississippi River bridge heading south on Highway 61, it's about a half mile down on your right hand side. I took this photo during the 2006 season at one of the Minnesota Twins games. They later went on to become the central division champs. This banner is in need of an upgrade before for the 2007 season begins. 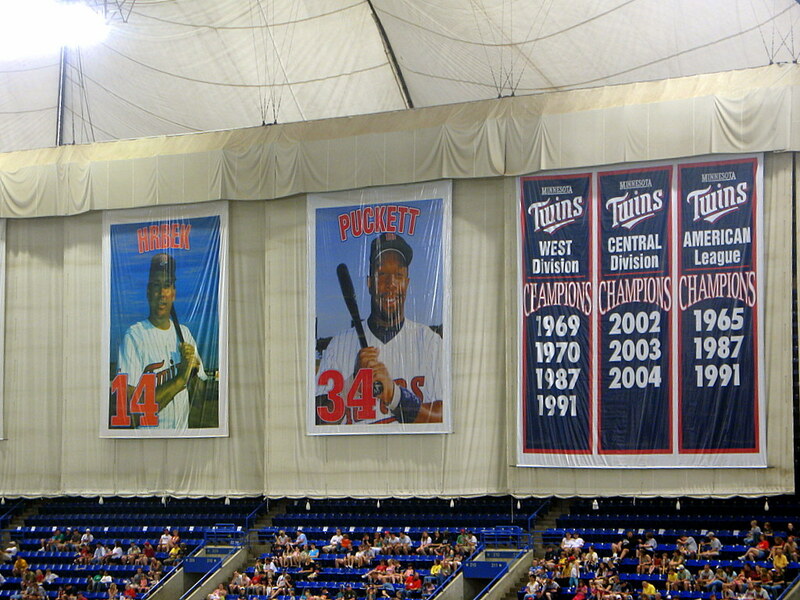 Kent Hrbek and Kirby Pucket photos hang next to the champion banners. Those of you who recall the first World Series the Twins won in 1987 recall what a duo these two ball players were during their tenure with the Twins. Kirby Pucket has passed on to greater pastures, Kent Hrbek can be seen on a few local fishing shows. Over in Cottage Grove there is a state park called the Cottage Grove ravine. This is the view from the top of it all. 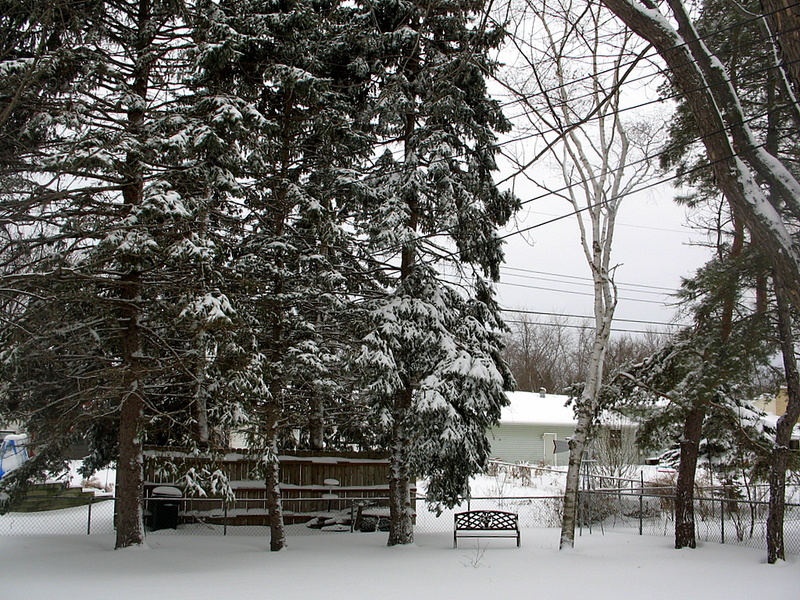 The photo was taken in the late fall. The colors turned out strange in this photo. What Hollywood movie is today's title quoted from? Continuing on from yesterday's hike on an old apple farm, I mentioned there were apples and lots of animals roaming around on the property. Here in Minnesota, hunting is rather popular as I'm sure it is in many parts of the country. 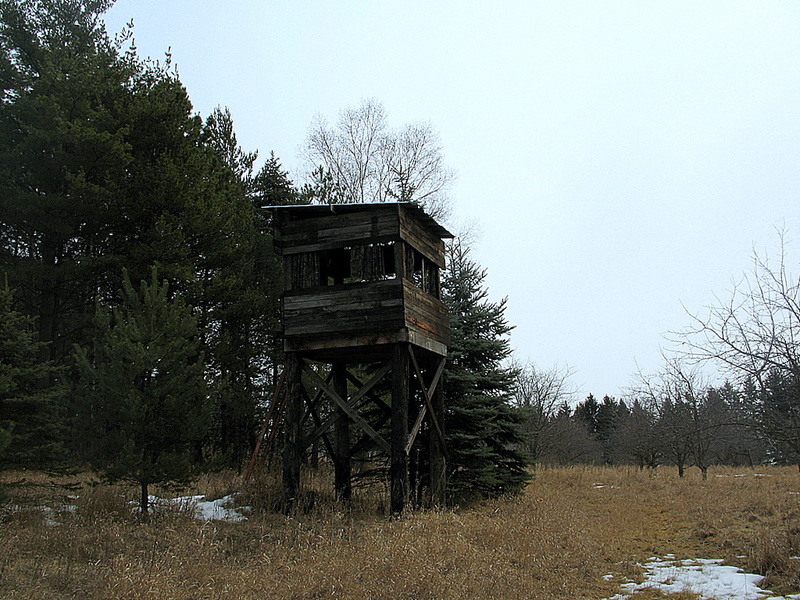 On the property we were hiking on, they had three deer stands scattered about. To answer the questions you may be thinking, we were not hunting, it is not deer season. My son and I went on a hike this past weekend on an old apple orchard farm. The apple trees are still there, but the public orchard is no more. With all of the apples, there is plenty of wild life abound. 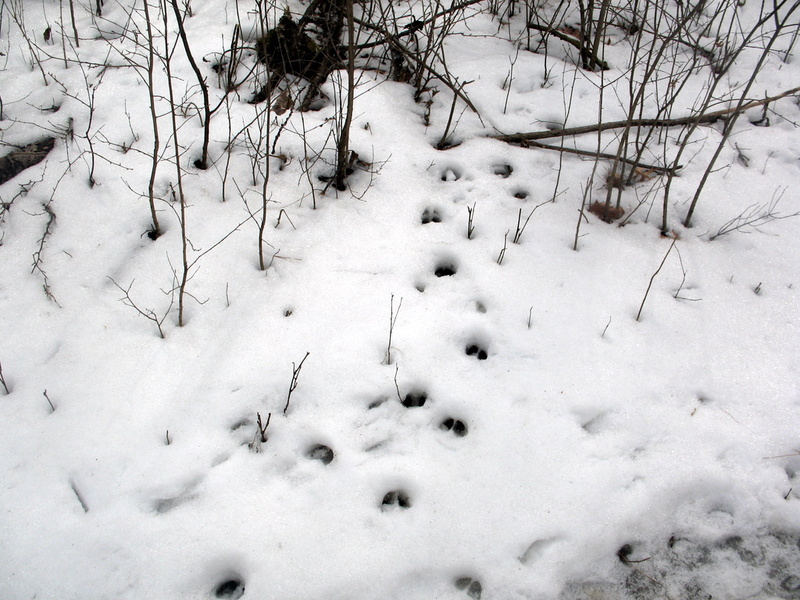 These were some deer tracks we had seen, they were everywhere actually. Wasn't sure how the photo would turn out with an all white back drop of snow, but the deer tracks turned out rather well in the photo. Nope, not yet....but they'll be blooming at the apple farms very soon. 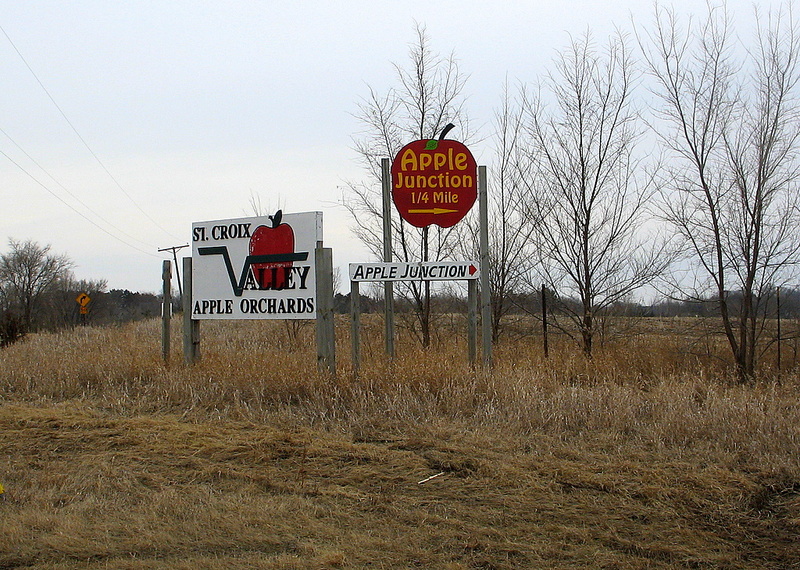 Here is a sign for one of many apple farms around the Twin Cities area. 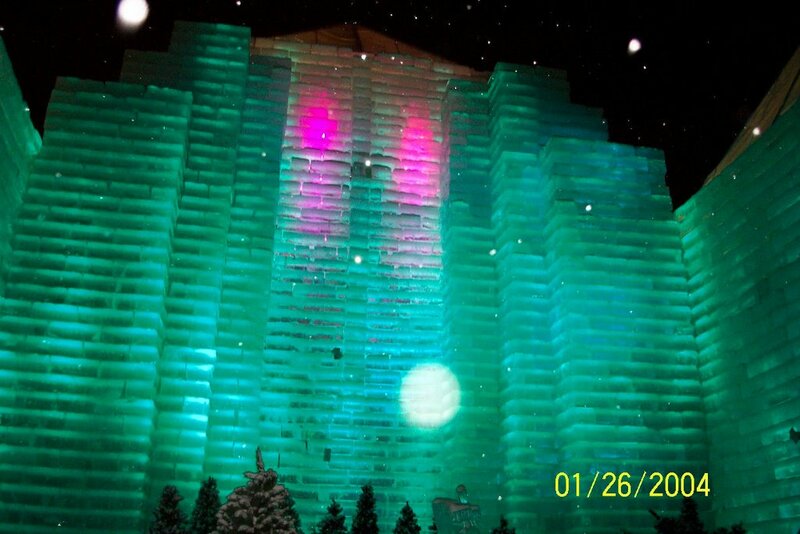 Massive Ski Slopes In The Twin Cities? Well, there is some skiing in the Twin Cities, but the hills are rather tame compared to the real ski mountains. If your driving in various areas near the ski slops, you'll see signs that look just like this one. 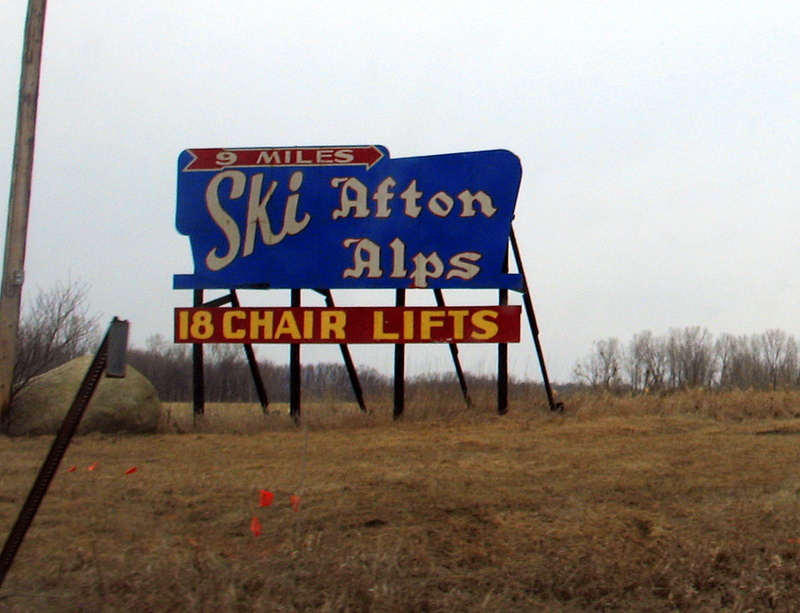 Afton Alps I believe is the biggest ski area in the Twin Cities. Today's photo was from a couple of weeks ago after we got dumped on by 12-18 inches of snow over a three day period. So quiet, so peaceful, untouched snow....yet I had zero desire to walk over and sit on the empty bench and soak it all in. This is quite the contrast from a summer photo I posted on August 25, 2006 shortly after a rain storm. See them dots? 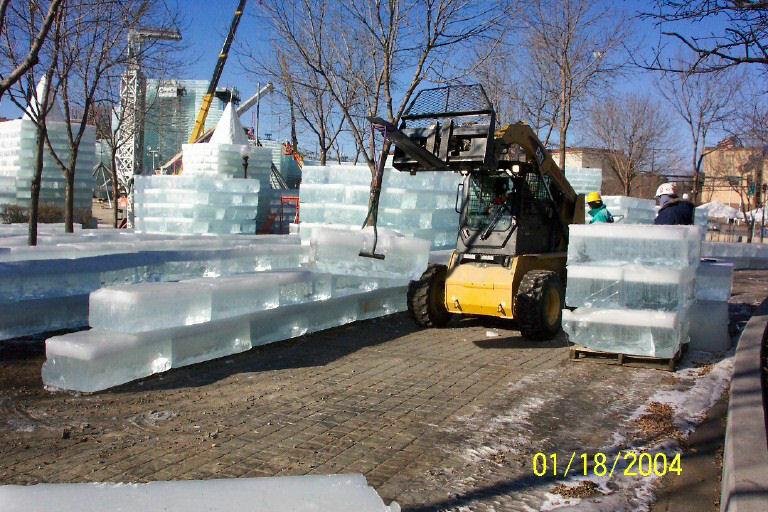 I'm not entirely sure why, but freezing a penny into an ice block was a trendy thing to do during the 2004 Winter Carnival Ice Palace. This photo was taken at the Mall Of America a couple of months ago when I was there last. It's just crazy what the roof of the Lego store looks like. Have you ever seen the top of a store look as fun as this one? Also, somewhere in this photo is David Hasselhoff. Kate from St Paul Daily Photo left a comment yesterday, she posed the question, who has more fun? The mom's and dad's or the kids? She's right, I had a blast making this car with my son. My son created the design of the pinewood car. We brought the kit over to grandpa's, because let's face it, he had the correct tools for the job. Plus he helped me make three or four pinewood derby cars when I was my sons age [thank you very much]. I then painted the car and fine tuned the wheels as best as I could. Racing day, watching the joy my son got as his car was clocking some very fast times race after race. My son/grandpa/me took home the third place trophy in the 'cub division' and we advance to the district pinewood derby race in April. The boys in the photo were the winners, five in the 'cub division' [top row], five in the 'tiger division' [bottom row]. 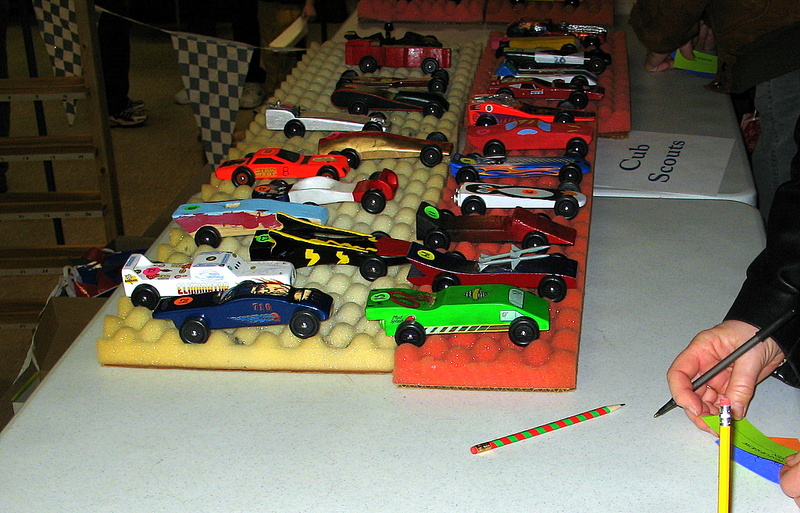 Sunday in Cottage Grove was the Cub Scout pinewood derby contest. If you're not familiar, or it's been a while since you've made your pinewood derby car....each car is made from a block of wood, you can make any shape you like, but it has to fit the track the cars travel down. The maximum weight of the car cannot exceed 5 ounces. 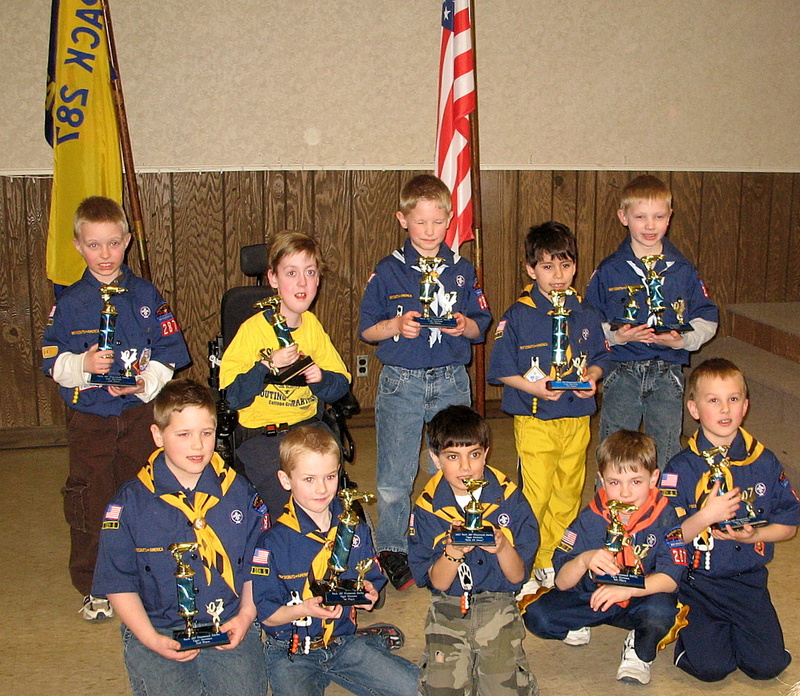 The photo shows the cars from the cub scout division. There was about 45 cars in all with three divisions. Tiger cubs [which I believe is 1st graders] cub scouts, and the third division is open to all non-scouts [mom's, dad's, siblings]. If basketball is your forte, I need to shamelessly promote one of my other websites. It is an online office pool that coincides with the Final Four tournament. I'm sure many of you have seen the brackets at one point in the past. I run my online and open to the public, there is no cost, but there are no prizes either. 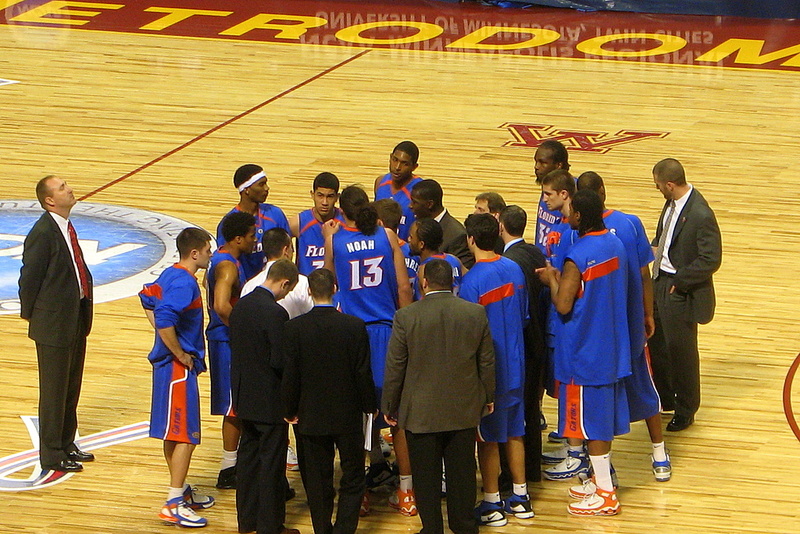 Today's photo was taken during the 2006 Minneapolis Regional Finals. I was able to see Florida Gators defeat Villanova. Florida went on the the final four weekend and won the tournament. 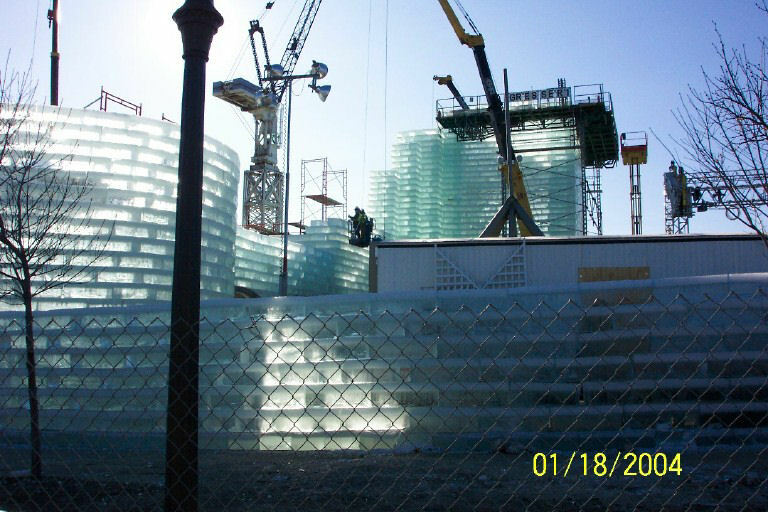 I was taking a photo of these silo's that can be found on the University Of Minnesota Campus [or at least they are in view while your in one of their parking lots], but looking at the photo, it's almost over shadowed by the large pile of rubble. 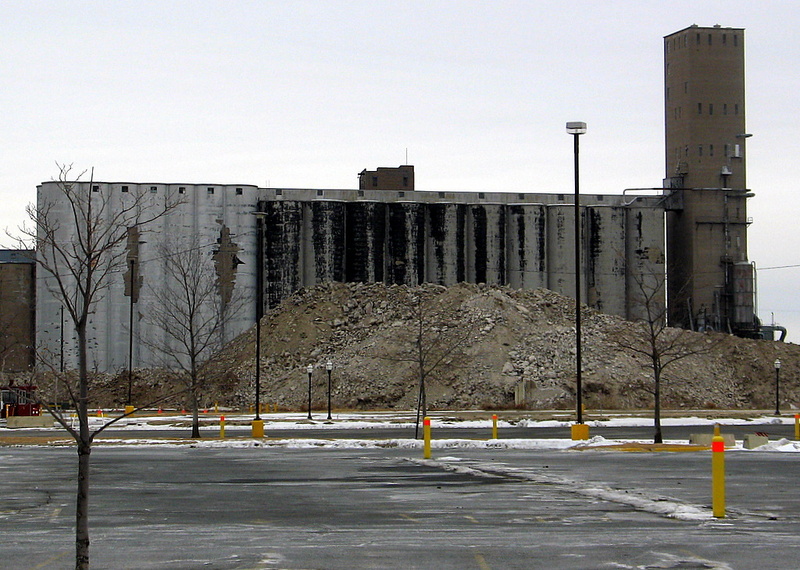 I found this building in St Paul that was in much need of repair or destruction. 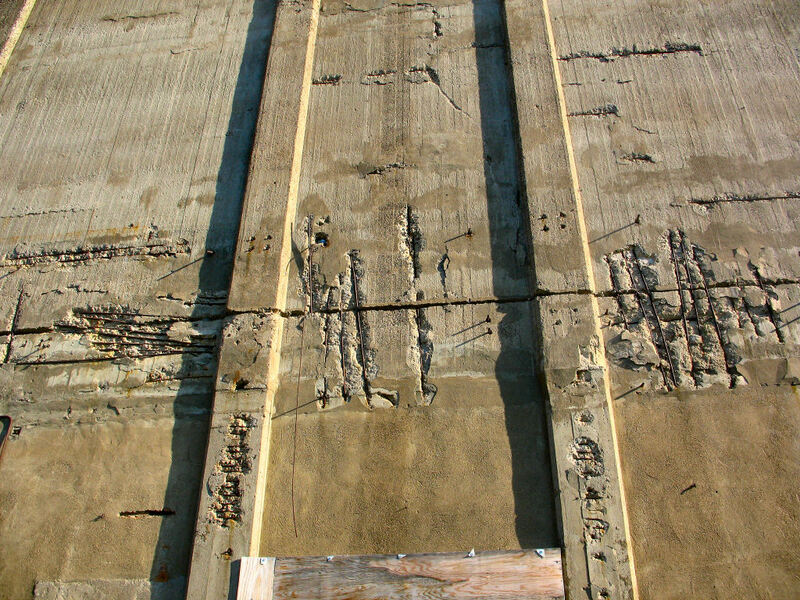 The rebar now exposed from the cement wall, rusting away in wintery months. 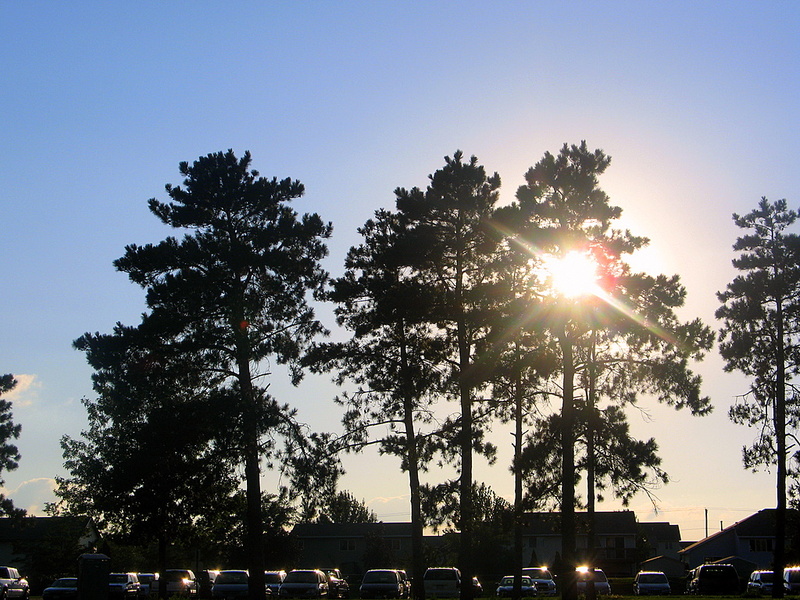 I was watching my daughter play soccer at one of the fields in Cottage Grove, we had the sun to our backs. I turned around mid way through the game and this was my view. The sun through the trees, reflections off of all of the cars. This gem of a water tower can be found in St Paul on the Cretin, Vandalia Street just as you exit and enter onto Interstate 94. 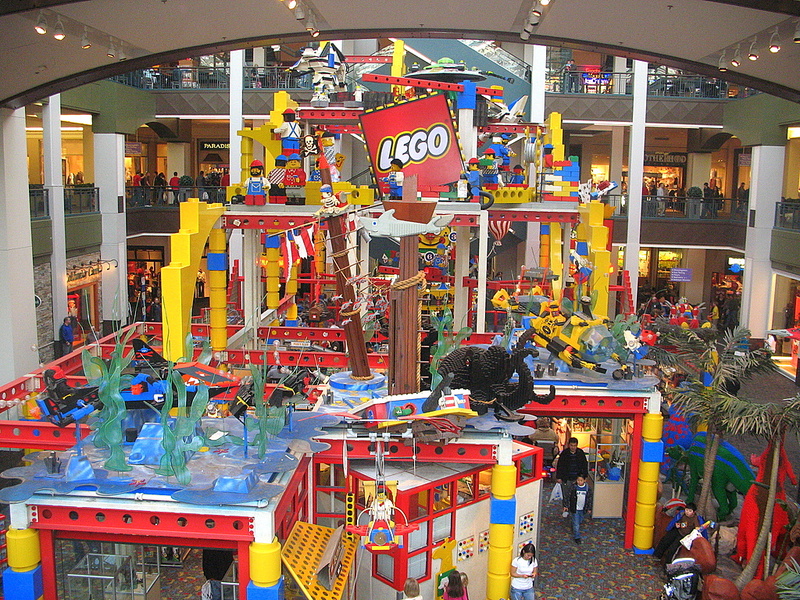 Just before Christmas time, I brought my two children to see Santa at the Mall Of America in Bloomington. There was a very long line of cars waiting for the light to favor them so they could proceed into the parking ramp. I've tried taking a photo of the ramp in the past, but they never turned out, I didn't care for the shot or usually, the ramp is so dang large, I could never show the size of it. Since I was waiting in line and at a stand still, I grabbed the camera and finally got the photo I've been wanting to show. 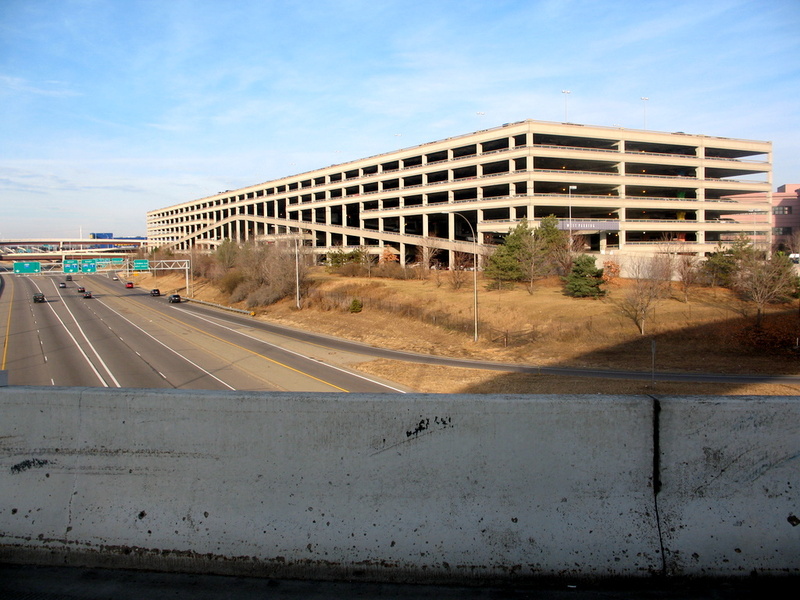 This is the West parking ramp, there is also an East parking ramp of the same size on the east side of the mall. I've found the easiest way in and out of the ramp is to take Cedar going south [also called Highway 77] and take the Killebrew Drive exit, then take the first left into the mall entrance and head to the West ramp. When you leave, take the same way out and you'll avoid many stop lights and much less traffic. Unless it's before Christmas and there are too many trying to get in at the same time [this will still be the quickest way in and out]. With all of the snow received over the winter, I've forgotten just how wonderful it will be once the weather warms. 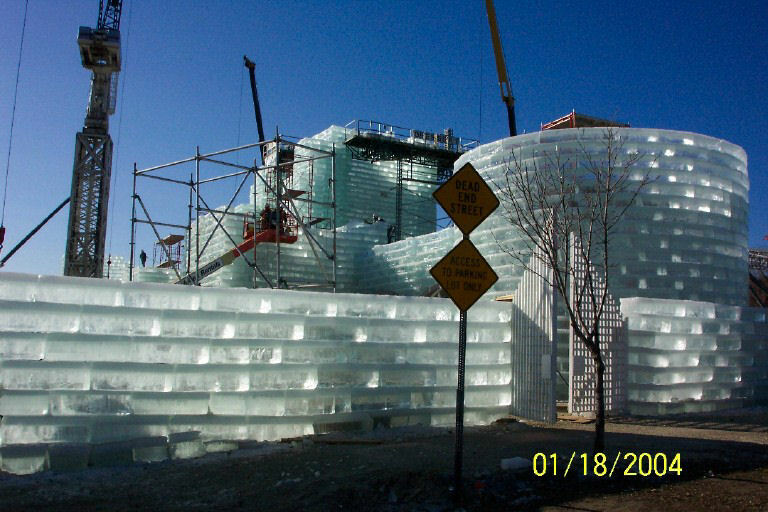 This photo was taken late in the spring of 2006 while driving along Sheppard Road just outside of downtown St Paul. The bluffs to the left, Mounds Park hosts a small lighthouse type tower. Which is hardly noticeable at the distance of the photo, but it is there and in working order for the St Paul airport which is just across the Mississippi River on the right side of the photo. 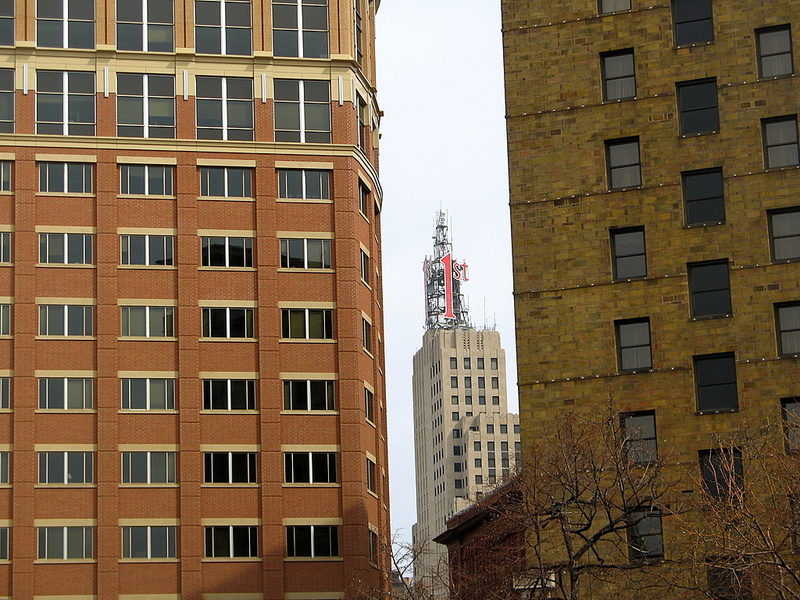 This shot was taken downtown St Paul a couple more months ago. It's been too long for me to recall what this building is that I've taken the photo of at the moment. 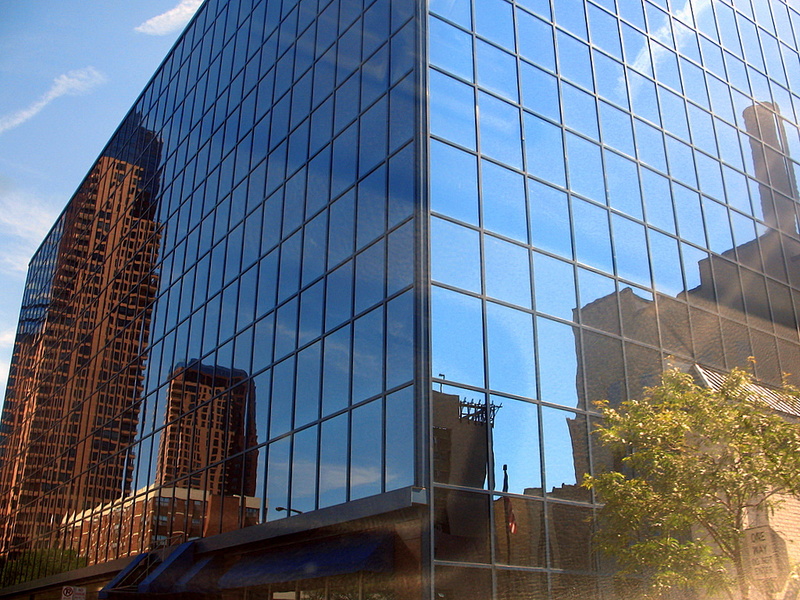 I wasn't going to post this photo until I found out, but I really like the shot with the double reflection. 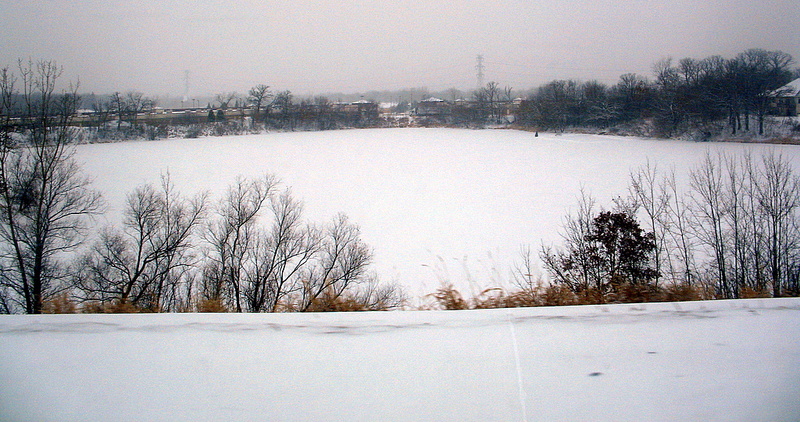 Minnesota's state slogan is the 'Land Of 10,000' lakes. Though I've heard talk of changing it to 15,000 lakes. We have a ton of natural lakes in this state I live in. The one on today's photograph is right along an exit ramp I travel past on my way to work. It's very small in size, but a lake it is. Throw in some cold weather and a layer of snow and it makes for an interesting photo. Is It Fair That I Miss All This Traffic? I am so thankful that I do not have to drive with the masses for most of my daily commute. Should I feel bad for these people who put up with the traffic day after day? Naw....they've chosen their path, I've chosen mine. Today I heard on my morning drive into work, the DJ was poking fun at the weather boy forecaster on how they have been overselling the weather lately. I was glad I was not the only one who was thinking this. The morning DJ went to a weather break and introduced the upcoming weather forecast as the "snow-mageddon" weather forecast. It made my day complete and it was just getting started. So yeah, the snow-mageddon forecasters were correct on the pending storm was going to be quite a snow storm. They for once were correct! School closing, people leaving work early. It's a lot to deal with and it's more snow than we've had in quite some time. Today's photo is a split screen photo. 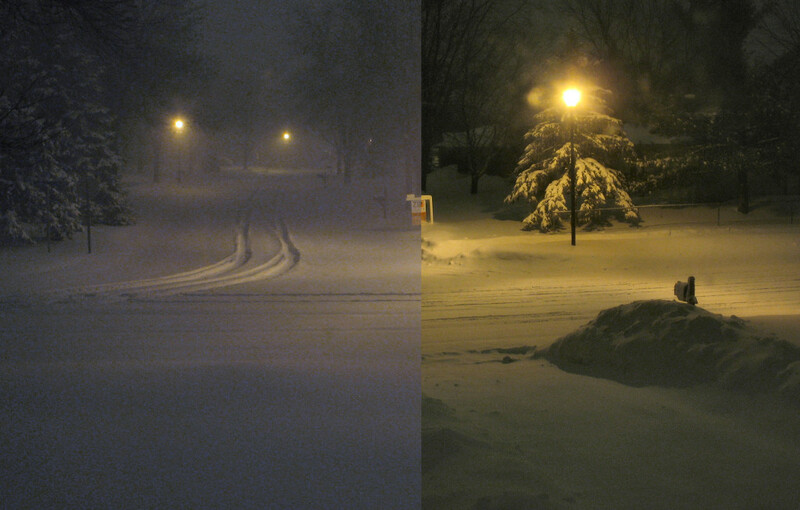 I snapped the frame on the left Sunday just after midnight. 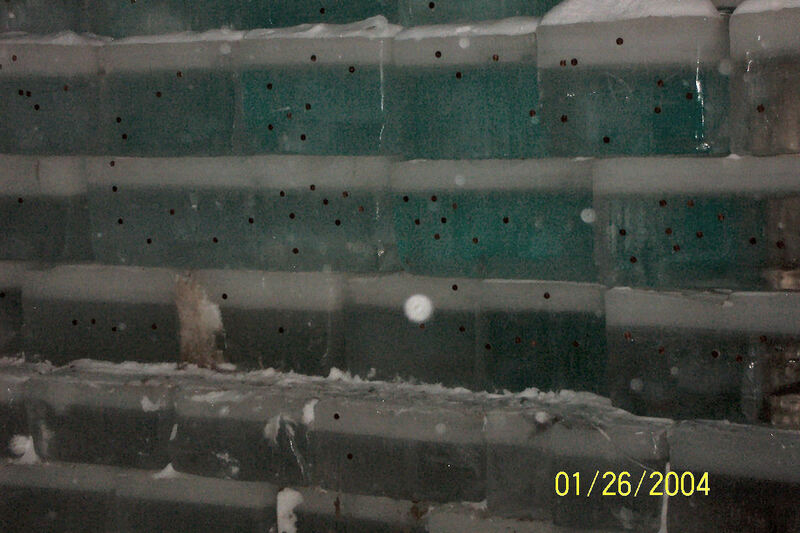 The frame on the right was about 30 minutes ago. I photo chopped them together so you can see the difference from the snow piles in my driveway from today versus five days ago. My back is killing me as my snowblower is currently not work, thus I hand shoveled that entire pile you can see on the right. Keep in mind, there is an equal matching snow mound on the left. By the way, it's still snowing and an expected 3-7 more inches of snow by morning. This means I will be shoveling more snow....go me! I took this photo while at work in February without any intension on using it for the March theme day. This is the father's first child, his wife had to be somewhere for an hour or so and she brought the new born into see daddy. After a quick feeding and a messy diaper, the end result was comfort and relaxation in dad's arms. 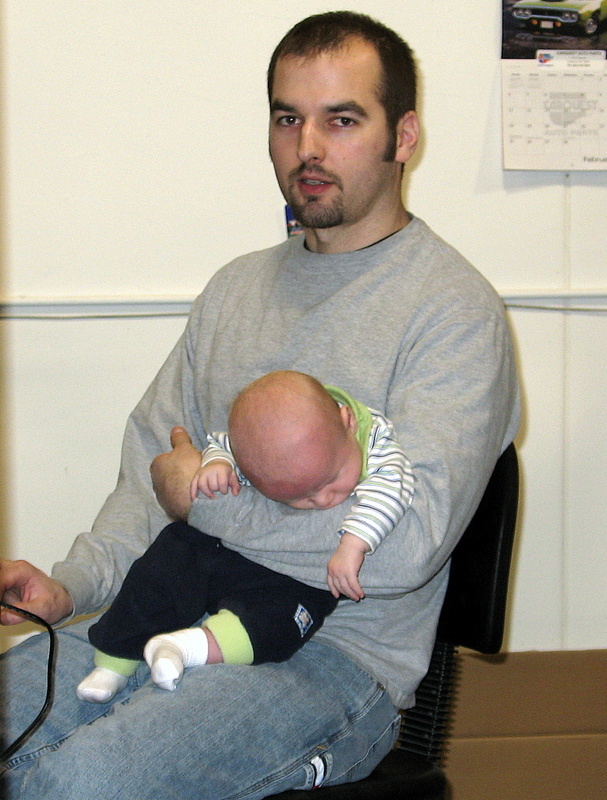 So for the theme of the month, this dad was working at work and working at being a dad all in the same photo.